Naomi Sallé is a La Leche League Leader in Amsterdam. 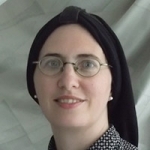 She also recently earned her diploma in Jewish education, at the Dutch Jewish Seminary (part of the University of Amsterdam) where she focused on breastfeeding and Jewish law. She lives with her husband and three of their homeschooled children in the small Jewish community of Amsterdam and has the joy of watching her eldest married daughter grow in her mothering and nursing. The Charedi Jewish community has specific barriers to breastfeeding: ● Outdated medical information has been passed into the community. ● The women who are helping mothers with breastfeeding may be untrained and without support. ● Misunderstanding of the Jewish law and community practices. ● A feeling of not being understood by medical practitioners. Dayan Evers, and Naomi Salle, did research into breastfeeding in Jewish Law. They found that medical advisers managed to persuade Rabbinical leaders that formula milk was as good as breastfeeding. This led to the idea that the Jewish laws, protecting the child's right to breast milk, no longer needed to be applied. Dayan Evers, and Naomi Salle have written a book on this subject and are attempting to educate the community that this decision was based on incorrect medical information. Naomi has interviewed many of the women who work within this community, and has identified Charedi women's concerns which may make them feel unable to follow breastfeeding advice, such as: ● Be able to have the circumcision on time. ● Following treatment and pumping on the sabbath. ● Not being understood by their care provider. Most Charedi woman desire to “nurse clean,” (without menstruating) this can be a vehicle for introducing helpful breastfeeding practices. This information can also be pertinent when helping Jewish mothers from all walks of life.